Have you been experiencing frequent mood swings? Is your skin breaking out? Have you gained unexpected weight and are struggling to shed it off? Is your period delayed or missed altogether? 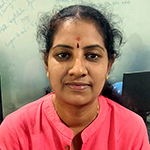 If you have been experiencing from at least two of these symptoms, then you are at the risk of suffering from Polycystic Ovarian Syndrome, also known as PCOS. It is a common hormonal imbalance condition in women and 1 out of 5 women are suffering from it today. Whether you have PCOS or are just experiencing common signs of PCOS, it is best to take action now. PCOS is an endocrine system disorder that impact hormone levels in women. Women develop small cysts on their ovaries, impacting their fertility levels. However, women suffering from PCOS may or may not have cysts, but their menstruation is impacted. They might have delayed or missed periods which make pregnancy difficult for them. It must be noted that they can still get pregnant; however, they might have to rely on other methods. Also, with this disorder, girls produce higher amounts of male hormones, which creates a hormonal imbalance in their system. Skipped periods, irregular periods, or extremely heavy bleeding during periods. Unwanted and excessive hair growth on the face and other parts of the body. Unexpected weight gain and struggle to lose weight. Change in the color of skin, like dark patches of skin around the neck, in the underarms, under the breasts. Hair loss or hair thinning on the scalp. Apart from these physical and biological changes in the body, many women experience bouts of anxiety and depression. Their self-image and body image suffer due to the changes in physical appearance. If not treated on time, PCOS can also lead to serious health issues like diabetes and heart diseases. However, this disorder can be prevented, and the symptoms can be cured with some healthy dietary changes and PCOS exercises. There is no straightforward answer to this question. Experts are yet to figure out exactly what causes PCOS. It is believed that production of high levels of male hormones and women’s body’s inability to mature eggs normally could be the reasons for hormonal imbalance and related issues. Other than that, high levels of insulin in the body can also cause this problem. Others believe that it may have a link to genetics. But it still remains unclear what exactly causes PCOS and how all the factors are connected. PCOS causes a negative impact on the body, disturbs the hormonal balance and regular menstrual cycle. While experts are still researching on the subject and its causes, it is important to understand that PCOS may not be easily diagnosable. There is not one single test that can detect the condition. A clear examination of the symptoms, physical examination, hormone profile, blood tests, and ultrasound to check the size of ovaries are some of the common ways to diagnose the condition. While in the beginning it may not seem like a serious issue, if not treated on time it can cause dangerous health problems to women. It can lead to diabetes as well. Women suffering from PCOS are at higher risk of developing anxiety and depression. Also, some studies suggest a link between PCOS and endometrial cancer. Nonetheless, people can still get pregnant. Many experts believe there is no certain cure for PCOS. It is actually a combination of treatments that can help manage the symptoms. A dietary change, lifestyle change and inclusion of hormonal birth control, anti-androgen medicines, and metformin is usually suggested. Some studies have shown that simply losing weight with diet change and PCOS exercise can do wonders to your body. It can correct the hormonal imbalance and resume a regular menstrual cycle. This way, it can help you manage the symptoms and go on to live a stress-free life. This article sheds light on how to lose PCOS weight with exercises. Here are a few best exercises for PCOS that can help you. There is no doubt that regular physical activity is important to maintain good health. But it becomes essential for women suffering from PCOS. 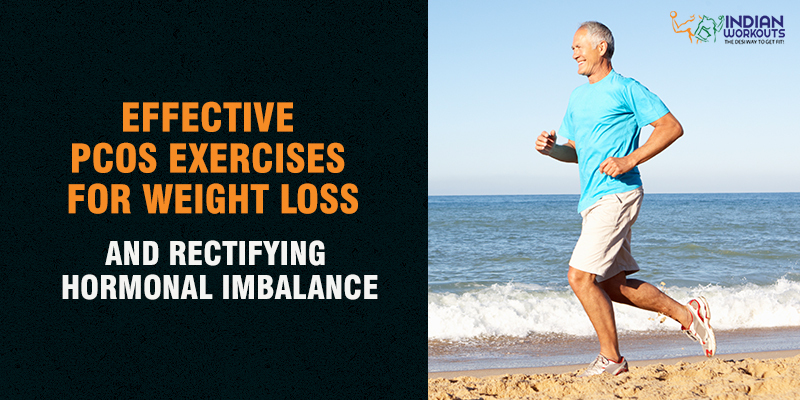 Regular exercise has many benefits. Not only does it help you lose weight and maintain a healthy weight, but it also helps in rectifying hormonal imbalance, improve mood, and increase the fertility levels. According to the experts, 150 minutes a week of moderate level exercise, or 75 minutes a week vigorous exercise is important to maintain a good weight. One can also include resistance and strength training exercise in their routine workout. This means at least 30 minutes of vigorous exercise each day is imperative to lose PCOS weight. Cardiovascular Exercises: There is nothing better than cardio workout to reduce weight, balance insulin levels, improve fertility, and stabilize hormonal effects on mood and anxiety. Among the many cardio workouts, you can go for long brisk walks, jogging, cycling, or even swimming. All of these activities provide a way to work all your muscles together, though the intensity varies. This simply means that walking may not train your muscles as effectively as swimming may. Doing 30 minutes of cardio workout a day can show immense improvement in overall health, enhance metabolism rate and reduce symptoms of PCOS. Cardio workouts are deemed to be one of the most effective exercises for PCOS weight loss. High-Intensity Interval Training: HIIT is a great way to tackle the symptoms of PCOS. It provides the opportunity to perform vigorous exercise and see results in a very short period of time. HIIT is a great PCOS exercise routine. As the name suggests, it is high-impact training that involves short intervals of high intensity workouts. This workout can get your heart racing and fire up the major muscles in your body in a short period of time. It boosts cardiovascular fitness, improves heart and lung health, reduces weight, improves balance and flexibility and enhances metabolism rate. Meanwhile, many studies suggest that an intense workout is a better way to manage PCOS and fight its symptoms. Pushing your will power and challenging your body is the key to reversing the condition. The best part about HIIT is that there is a diverse range of workout that you can experiment with. 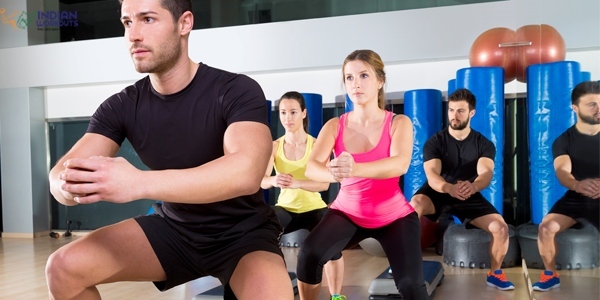 You can even transform your daily fitness routine into high-intensity interval training. Whether it’s cycling, running, jogging, walking, sprinting, or other floor exercises, you can create a new routine every day without getting bored. Strength Training: This is the most fundamental type of exercise that must be a part of PCOS exercise routine. This form of training is not only great for building muscles, but it also burns calories and helps you lose weight. The best part is that there are numerous ways of doing strength training for PCOS weight loss. Using Dumbbells, barbells, kettlebells, resistance bands, and even your bodyweight are some of the most effective ways to train. There are many benefits of these exercises, particularly for PCOS patients because it reduces insulin resistance, helps in shedding unwanted fat, and improves metabolic rate. It helps in the growth of muscles that prevents you from storing fat in your body. It alleviates bad cholesterol from the body and improves mental health, self-esteem, and self-image. These are some of the hardest hit aspects of PCOS sufferers and it can all be tackled with the help of strength training. Experts suggest lifting weights, squatting, pushup and pull up workouts are some of the most highly-recommended forms of strength exercises. One muscle at a time or bodyweight circuits are some of the suggested forms of strength training PCOS exercise plan. Squat Jacks: It is one of the most effective PCOS exercises that can be incorporated in a daily routine. It is a perfect blend of cardio and resistance training where you use your bodyweight as resistance against gravity. Glute Bridges: This master exercise helps relieve symptoms of PCOS in no time. It’s simple yet effective and needs no equipment to perform. 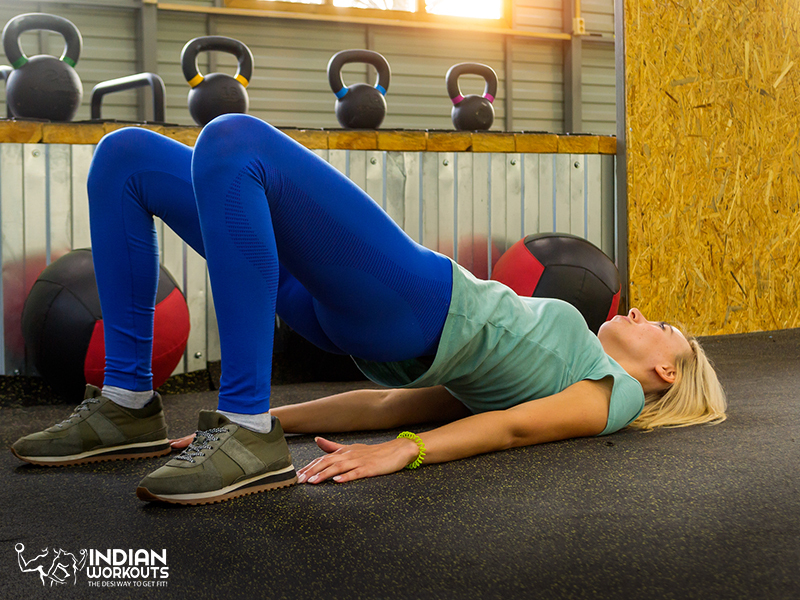 All you need to do is lie down on your back, fold your knees and lift your torso while pushing the weight through your feet. Squeeze your core as you hold the posture for a few seconds, before returning to the starting position. Walking Lunges: Take regular lunges to the next level with this version of lunge exercises. This exercise will not only enhance the strength in your legs, but it will also make your core stronger. 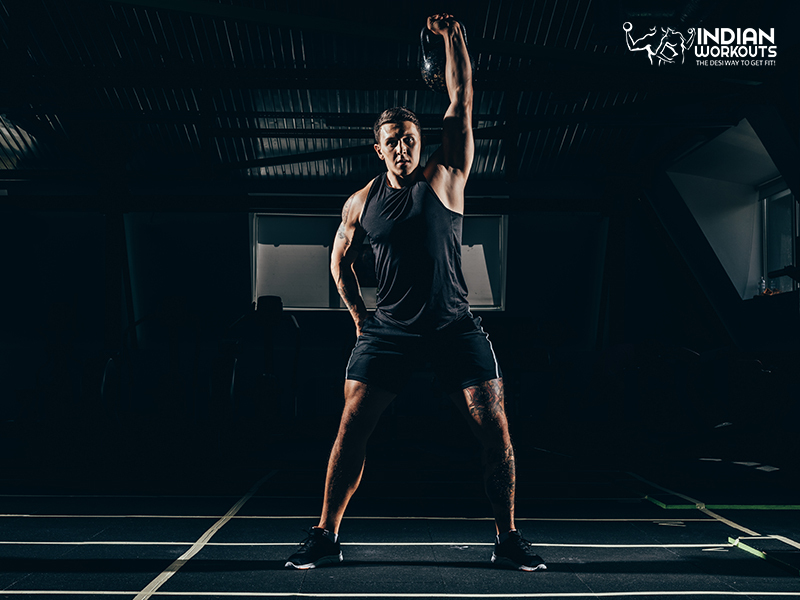 Turkish Get Up with Kettlebell: This exercise is a total body workout that involves several movements. One can use kettlebell, dumbbells, barbells, and other kinds of free weight equipment to perform this exercise. This single workout includes a rolling pattern, lunge pattern, overhead hold, hip hinges, core training, glute stimulation and more. It is the secret of old-time strongmen. 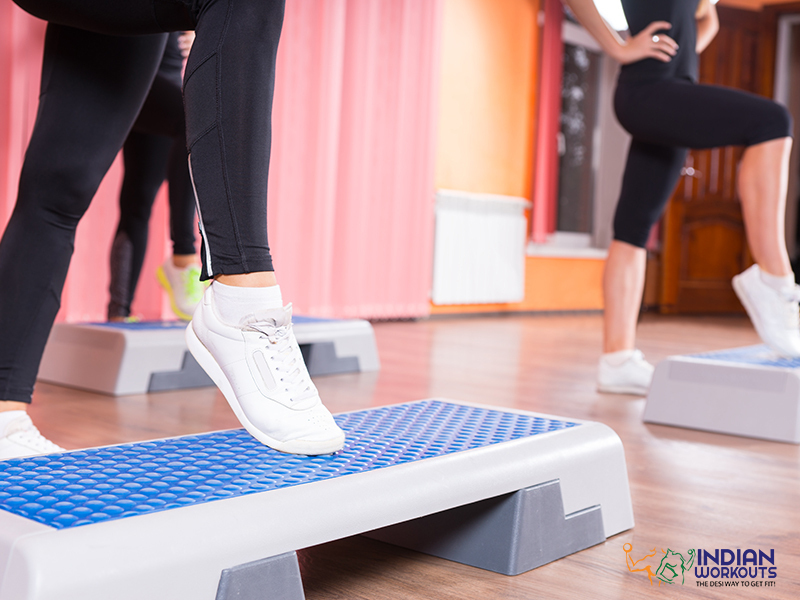 Weighted Step ups: Weighted step ups is a great exercise to include in your PCOS exercise plan. It is a simple exercise that requires you to perform step-up movement repeatedly holding a weight that you are comfortable with. Mountain Climbers: This particular exercise activates all the major muscle groups in the body and improves cardiovascular fitness, increases strength and flexibility, improves blood circulation levels and hormone levels. It engages upper arms muscles as well as core and leg muscles. Apart from these strength training exercises for PCOS treatment, lifting free weights twice a week is recommended for PCOS. Core Strengthening Exercises: These are common PCOS exercises and improve the chances of pregnancy in the patients. These muscles support the spine and strong core muscles are essential for pregnant women for a healthy pregnancy. It even ensures correct hormonal balance in the body. Flutter Kicks, Planks, Knee tucks, Russian twists, crunches, leg raises, and reverse crunches are some of the basic and best exercises for PCOS weight loss and strengthening. Zumba: Any kind of physical activity is beneficial for PCOS. However, Zumba tops the list of many fitness and health experts. This is a form of aerobic exercise that helps in boosting the fat breakdown process. The movements involved in Zumba training help in reducing insulin resistance that can negatively impact thyroid function, body weight, cause acne, excessive hair growth and more. Since this workout is inspired by dance and aerobic movements, this is going to be a fun way to reduce the effects of PCOS and lose weight. Undoubtedly, you will learn a few impressive moves too. The high-energy classes will definitely boost your mood and relieve tension and anxiety. There are different kinds of Zumba classes to choose from, that vary in intensity. Yoga: The ancient art of yoga is considered to be the key to good physical, mental and spiritual health. Many studies have shown how various Yoga poses have benefitted PCOS patients in rebalancing the disrupted levels of hormones. Some of the poses can also help in inducing periods, in case of a skipped cycle. It is said to be an inexpensive and most natural way of correcting PCOS. Some of the yoga poses to practice for PCOS weight loss are Butterfly Pose, Cobra Pose, Boat Pose, Bow Pose, Child Pose, Cat Pose, Bridge Pose, Garland pose, and Lotus Pose. These poses help women who are suffering from irregularity in menses. Apart from these forms of PCOS exercises for weight loss, you can also practice Pilates, swimming, cycling, and Tabata. The options are endless. All you have to do is challenge your body and push your limits. Along with physical activity, it is important to make some dietary changes that include nutritional foods for both mind and body.